The following “72-Hour Report” was distributed by the Wildland Fire Lessons Learned Center August 28, 2018 for an incident that occurred August 19, 2018 on the Mendocino Complex of Fires in Northern California. Property Damage: Radios, packs, 2 vehicles with paint blistering. On August 19, 2018, six firefighters received injuries when the fire crossed the dozer line in multiple locations and cut them off from their planned egress. At the time of the incident, firefighters were en-gaged in firing operations off a dozer line near the division break between Hotel and Juliet on the Ranch Fire of the Mendocino Complex. Information from RAWS nearby around the time of this incident, showed temperatures at 93.3 Fahren-heit, RH 11.3%, and winds at 6.6 mph with gusts to 13.3 mph. The Mendocino Complex consisted of the Ranch and River fires that started on July 27th. The fires experienced significant growth during the first ten days, growing 30,000 acres on August 3rd, 40,000 acres on August 4th and 50,000 acres on August 5th. Up until August 19th, the fire growth had been steadily moving both south/southeast and north/northeast. Most days experienced warming and drying trends with very poor recoveries and critically low fuel moistures and afternoon relative humidities near single digits. 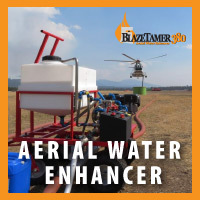 Steep terrain, poor ventilation, fire intensities and long travel times made it difficult to insert crews and utilize aircraft in certain areas of the fire. On August 19th, the plan for the fire’s northeast flank was to secure dozer line north of DP25 near the division break in Branch II with a firing operation. Resources from other divisions were brought over to help with the operations. 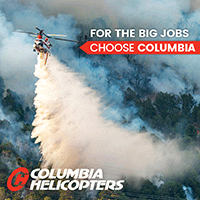 These resources included federal and local fire resources and strike teams from the Los Angeles Fire Department and CAL FIRE. After arriving near the drop point, the personnel staged their engines and vehicles, reconfigured, and were split into two modules to support burning operations and hold the line along a Forest Service road and the dozer line. During the burnout operations, a sudden wind shift and explosive fire growth happened and at about 1733, personnel were cut off from their escape routes. Most of the firefighters were able to move back to their vehicles to exit the area. However, six individuals farther down the dozer line were forced to run in front of the advancing flame front, through unburned fuels to a nearby dirt road for approximately one mile before they were picked up and transported for treatment. Five Los Angeles Fire Department firefighters and one CAL FIRE firefighter were injured. Two unoccupied CAL FIRE emergency crew transports parked in the vicinity sustained damage from the fire when it jumped containment lines. Injuries include 1st and 2nd degree burns and a dislocated shoulder. Dozens of firefighters were entrapped and endured a harrowing escape through very thick smoke and flying embers. Above: an image from the official report, showing the conditions as firefighters were making their way to the safety zone. The Wildland Fire Lessons Learned Center has released a review of the entrapment of dozens of firefighters that occurred six months ago on the Canyon Fire at Vandenberg Air Force Base. On September 19, 2016, two days after the fire started, approximately 50+ firefighters were assigned to Division Zulu on the north side of Honda Canyon, about a mile east of the site where four Air Force firefighters were entrapped and killed on the Honda Fire in 1977. Assigned to the division that day were 8 engines, 4 dozers, 1 water tender, and a 20-person hand crew comprised of 3 helitack crews. All were ordered by the Division Supervisor to take refuge in a safety zone. 3-D map of the Canyon Fire looking east. The red line was the perimeter of the Canyon Fire at 11 p.m. PDT September 20, 2016. The white line was the perimeter at approximately 11 p.m. September 19. After observing conditions that morning last September the tactic decided on was to fire out the ridge on the north side of Honda Canyon, which runs east and west. The main fire was to the south on the other side of the canyon. The operation was going well until the intensity in the burnout increased dramatically; fire whirls developed and the fire began spreading to the west more quickly than the igniters and holders could keep up with it. The Division Supervisor ordered, “All Division Zulu resources pull back to the safety zone”. Even though some of the personnel were about 600 to 700 yards from the safety zone, the smoke-obscured visibility occasionally made movement difficult or impossible. At times the engines had to stop when they could not see the ground in front of them. Burning embers, some of them fist-sized, pelted the vehicles and the 20 people in the hand crew that were walking to the safety zone. In the video below, it appears to have taken about 10 minutes to travel the 600 to 700 yards. The recording shows how harrowing it must have been as day turned to night. At least two firefighters were later transported to a hospital suffering from smoke inhalation injuries. The video is incredible and at times has on the screen views from three different cameras, apparently time-synced. Pretty impressive editing (by Mark Pieper and Tony Petrilli) for a government-produced video. The maps and annotated still images are also very useful. A screenshot from the video, at minute 7:39. Some firefighters, approximately two, removed their fire shelters from their gear. One was fully deployed and another was partially unfolded. 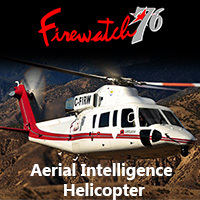 We covered the Canyon Fire as it was burning and thought we were aware of the major developments at the incident, but we did not hear about this entrapment until today, March 27, 2017. 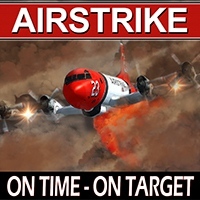 Maybe we missed it, but it is possible that the fact that it occurred on a military base influenced an apparent desire to keep it low key, even though a California Type 2 Incident Management Team had assumed command of the fire the morning of the incident and, according to the report, “did start Regional notification regarding the shelter deployment”. The Incident Commander and the Deputy IC were first notified more than three hours after the entrapment. In spite of the late release of the information, firefighters can benefit from this lessons learned opportunity and the fact that the preparers of the report conducted it in such a way that there were apparently few if any efforts among those involved to “lawyer up” and shut up fearing litigation or prosecution. Many still and video images were made available and at least enough of the firefighters were willing to talk about what happened to allow a useful report to be completed. Maybe the way this review was conducted can be a template to reverse the recent trend of investigations that are not as useful as they could be. On September 21, 2016 a Ventura County Fire Department firefighter was killed in a vehicle accident while responding to the Canyon Fire. Fire Engineer Ryan Osler, a passenger in a water tender, lost his life. The driver of the truck self-extracted and was transported to a local hospital with minor injuries. 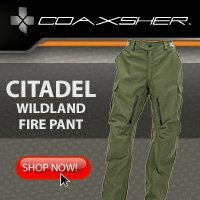 Articles on Wildfire Today tagged “Canyon Fire”. Above: Two of the fire engines that were entrapped on Corsica. The engine on the left appears to have small water nozzles on the bar that encircles the top of the cab. During night firefighting operations on the island of Corsica overnight on March 24 and 25 three fire vehicles were entrapped by the fire resulting in five firefighters suffering first and second-degree burns. Some of the firefighters, it is not clear how many, took refuge in one or more of the fire engines that had vehicle protection systems consisting of water nozzles positioned around the truck that could be activated as needed. In the early evening, a group of firefighters found themselves trapped in flames as a result of a change in wind direction. They then took refuge in their vehicles equipped with a self-protection device. One person is in police custody, suspected of starting the fire. Three firefighter vehicles were damaged or destroyed in the incident. The fire engine in the above photo appears to be the same one in the photo (on the left) at the top of this article. Wildland firefighters in Australia have also been using similar engine protection systems for years. Above: Country Fire Authority test of engine burnover protection systems. Screen shot from CFA video. The Aussies are far ahead of wildland firefighting agencies in the United States when it comes to the protection of personnel during fire engine burnovers and rollovers. Since 1977 Victoria’s Country Fire Authority (CFA) has been creating, evolving, and improving systems to increase the odds of firefighters on an engine surviving if their position is overrun by fire. These efforts were intensified after two engine burnovers in 1983 and 1998 killed a total of 17 firefighters. During the last 39 years the vehicles have been hardened in various ways. 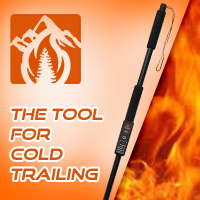 Examples include internal radiant heat curtains and nozzles positioned around the exterior of the truck that spray water as the fire approaches. We did a quick search on Wildfire Today for “engine burnover” and were surprised at the number of results. Take a moment and at least look at the titles and brief excerpts. These, of course, are just articles on our website. 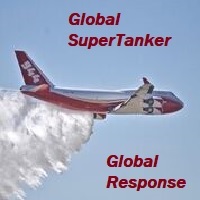 We make no claim that all engine burnovers are included since we started this website in 2008. Below is a screen shot from the CFA video. 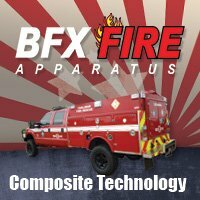 Country Fire Authority test of engine burnover protection systems. Screen shot from the CFA video. What if — in 2006 the five U.S. Forest Service firefighters that were entrapped and killed on the Esperanza Fire, instead of working on an engine similar to the USFS engine farther down this page, had been assigned to one built to CFA standards. Would they have taken refuge in the engine, pulled down the thermal protection shields and turned on the truck protection water spray instead of attempting to survive the fire outside the engine? One feature of the CFA engines we noticed was a heavy-duty internal roll bar. Internal roll bar in a Country Fire Authority engine. 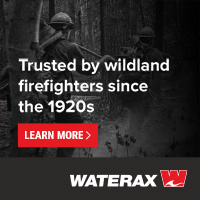 We have written before about the need for U.S. wildland firefighting agencies to improve the survivability of engine crews during rollovers. These accidents involving large fire trucks, especially water tenders, are common. In our opinion it is disgraceful that the outfits employing thousands of firefighters on engines have not taken this step to provide a safer working environment for their personnel. The photo below is from one of the 34 articles on Wildfire Today tagged “rollover”. On August 8, 2013 Engine 492 from the Medicine Bow-Routt National Forest and Thunder Basin National Grasslands was involved in a rollover accident on Wyoming State Highway 450 southwest of Newcastle, Wyoming. Three firefighters were injured, one seriously. Thanks and a tip of the hat go out to Cameron. Above: Fire whirl on the Cedar Fire, June 28, 2016, around the time of the entrapment. Screen grab from the video. A report has been released on the entrapment of six firefighters that occurred on the Cedar Fire south of Show Low, Arizona June 28, 2016. The firefighters were part of the Navajo Interagency Hotshot Crew (NIHC) that remained along with two Type 6 engines and possibly one other crew after the Type 1 Incident Management Team was released the previous day. The assignment of half the crew, nine firefighters, was to “monitor” a part of the southwest side of the fire that had six miles of uncontained fire edge. The other half was working on the southeast side. Three of the nine personnel on the southwest side served as lookouts while the remaining six were monitoring and checking the fire edge. When a very large fire whirl developed near the six, they realized their escape route was cut off, and took refuge in a previously burned area. The ground fuels had burned, but the canopy was still intact. As the fire approached they deployed their fire shelters, remaining in them for about 30 minutes. The entrapment site at the Cedar Fire. After the fire whirl subsided, the squad members were able to hike out to staged vehicles. They were transported in three ambulances, medically evaluated, and transported to Summit Hospital in Show Low, Arizona where they were evaluated. Two firefighters were treated for smoke inhalation and all were released by 10 p.m. that evening. The report says the personnel deployed and entered the shelters just as they had practiced several times in training, and the devices worked as designed. There were no difficulties, as reported at other entrapments, with the PVC bags becoming soft and difficult to open. Thankfully there were no serious injuries and the training the firefighters had received paid off. On June 27, the day before the entrapment, the Type 1 Incident Management Team issued their final update on the 45,977-acre fire just before they were released later that day. Below is a portion of the document. The report claims the Type 1 Team recommended that the number of personnel assigned be reduced on Tuesday June 28 to about 400. But on Monday, June 27 all firefighters except for two Type 6 engines were released. With a 70 percent chance of rain in the weather forecast, on Tuesday the local agency decided to replace the Type 1 Team with a Type 4 Incident Commander, two Type 6 engines, and one or two hand crews. The crew(s) had to be re-mobilized on Tuesday after being released. Some aircraft were also assigned on Tuesday. About 20 minutes before the 2:45 p.m. entrapment the weather at the fire was 95 degrees, 21 percent relative humidity, with a 7 to 10 mph wind out of the south. Although “numerous” people observed dust devils and fire whirls before the large fire whirl formed, there was no discussion about modifying fire suppression tactics. Dust devils can be an indicator of the potential for extreme fire behavior. Fire whirl on the Cedar Fire, June 28, 2016. Screen grab from the video. 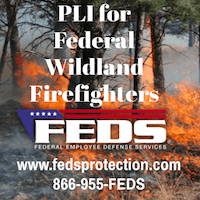 On Sunday the Bureau of Indian Affairs released a “72-hour report” that contains a few more details about the entrapment of six firefighters and deployment of their fire shelters on the Cedar Fire south of Show Low, Arizona. The new information includes mentions of a large fire whirl and three lookouts that were posted. Below is the press release version of the 72-hour report. The formal memo-style document is HERE. They contain approximately the same information. “On June 28, a large fire whirl formed near six members of the Navajo Interagency Hotshot Crew (IHC), entrapping them. In response to the intense heat, flying ash and woody debris, the firefighters deployed their fire shelters. Throughout the 15 minute event, the crew maintained radio communication with each other and agency personnel. Aviation and safety resources were immediately dispatched to assist the crew. After the fire whirl passed, the IHC walked out of the fire area and were transported to Summit Healthcare in Show Low, Arizona. Two firefighters were treated for smoke inhalation and all six firefighters were released from the hospital that evening. After the crew was released, a Critical Incident Stress Management Team was made available to the crew. The Bureau of Indian Affairs initiated an Interageny Serious Accident Investigation (SAI) that evening. On June 30, the SAI Team members, led by Clark Richins, Team Leader, Bureau of Indian Affairs, reported to Western Region, Fort Apache Agency. Members of the SAI Team include: Chief Investigator, Safety Officer, Personal Protective Equipment Specialist, Long Term Fire Analyst, Hotshot Crew Representative, Public Information Officer, Writer/ Editor, and Regional and National Agency Liaisons. The investigation will collect evidence, which includes conducting personnel interviews, inspecting equipment and analyzing photographs, weather and voice data. On June 30, the SAI Team completed their interviews of the IHC, which allowed the crew to return home. According to the National Wildfire Coordinating Group Terminology Glossary, a fire whirl is a spinning vortex column of ascending hot air and gases rising from a fire and carrying aloft smoke, debris, and flame. Fire whirls may range in size from less than one foot to over 500 feet in diameter and have the intensity of a small tornado. Prior to the event, the crew was working along the western flank of the uncontained fireline where they had previously been assigned for several days. At 12:00p.m three nearby lookouts observed low intensity surface fire, but by 2:00p.m., as the day got warmer, the fire behavior increased. These lookouts and an additional firefighter scouting the fireline witnessed the large fire whirl. While managing wildland fires is inherently dangerous, all firefighters are trained to minimize the risk they take on every assignment. In the rare circumstance firefighters are faced with an impending entrapment, they are trained to consider all options to insure the safety of all crew members. This includes deploying fire shelters for protection from smoke, heat, and embers. The Navajo Interageny Hotshot Crew executed their training, which resulted in a successful outcome to a hazardous wildfire anomaly. Thanks and a tip of the hat goes out to Jonah.